Those hearty cold weather delights are popping their heads up despite the frigid temperatures and repeated snow storms. 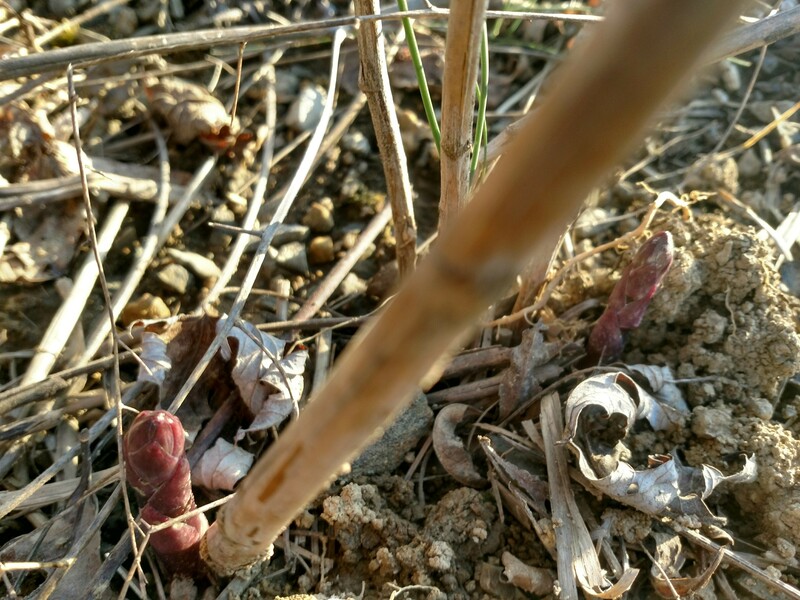 I was most delighted, and a bit shocked, to see the tender purple asparagus shoots peaking through. 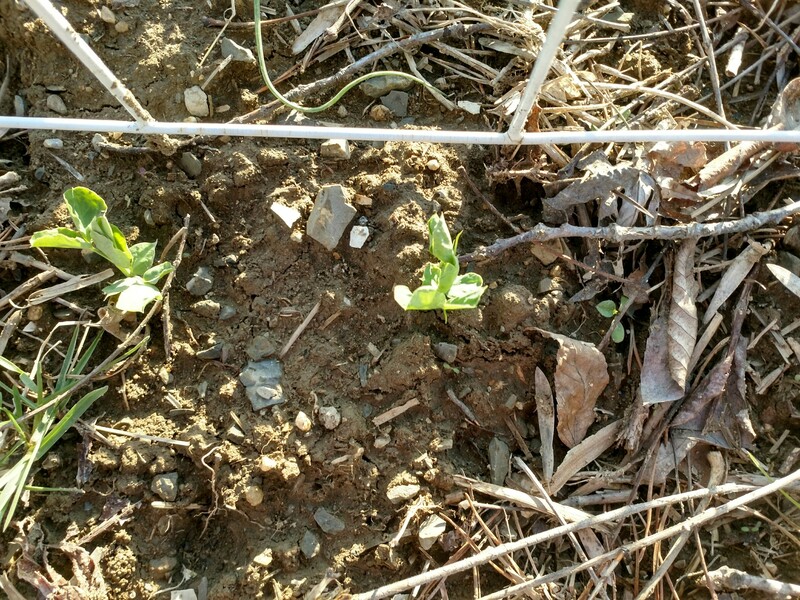 Since I don’t recall a single day in the last three weeks hitting 50, this was unexpected from this plant usually triggered by soil temperature. Peas were a close second in bringing a broad smile to my face. As I walked around each bed this weekend to detect the slightest sign of growth (does anyone else do this more than once a day in early spring? ), I found some welcome surprises. 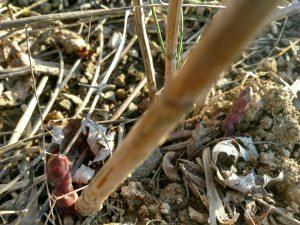 Purple asparagus getting stubborn about waiting for warmer. Me too! Among those hearty seeds or bare root plantings that decided to become leaves braving the chill were strawberries, rhubarb, asparagus, turnips, garlic (of course), romaine lettuce and carrots. Still waiting on broccoli, spinach and a few others planted on that 65 degree day in February I thought was the mark of an early spring, but I’m quite pleased I won’t miss the season this year for some of my heat-recoiling favorite treats. Fresh peas, anyone? Won’t be losing that one to heat this year. I like to play with my food, so this is a favorite spring snack treat for me. 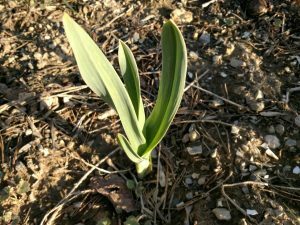 Elephant Garlic rounds out the mix this year as a new selection with six other types of hardneck and softneck varieties from prior years staying steady. 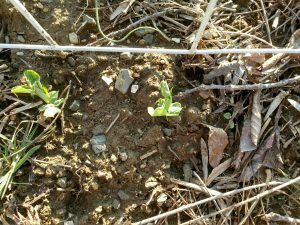 This is a new try this year – artichokes. 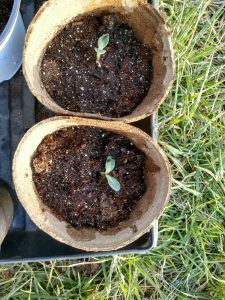 No idea if these promoted perennials will produce even once, let alone in years to come, but figured I’d give it a shot now that I’m far enough south to consider such a thing.